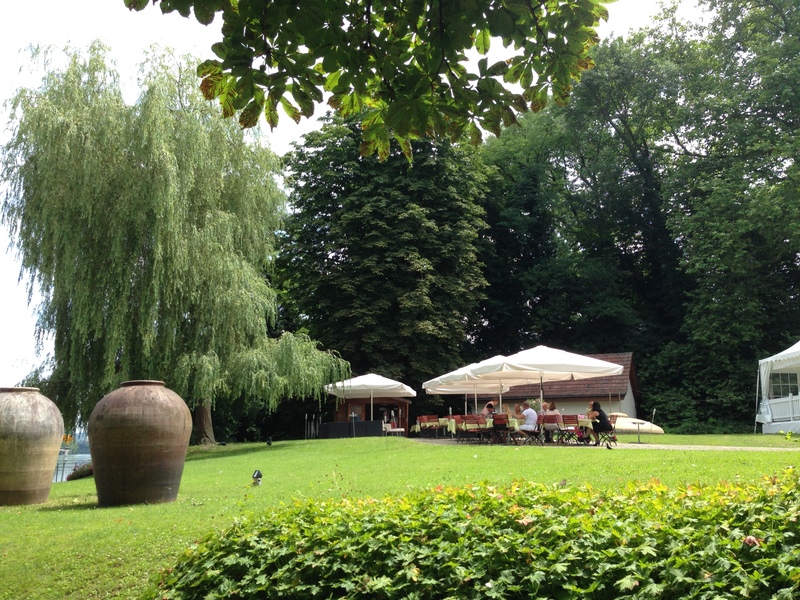 In the summer, the Gastof Solbad opens their garden bordering the Rhine. It is a great setting under a weeping willow. 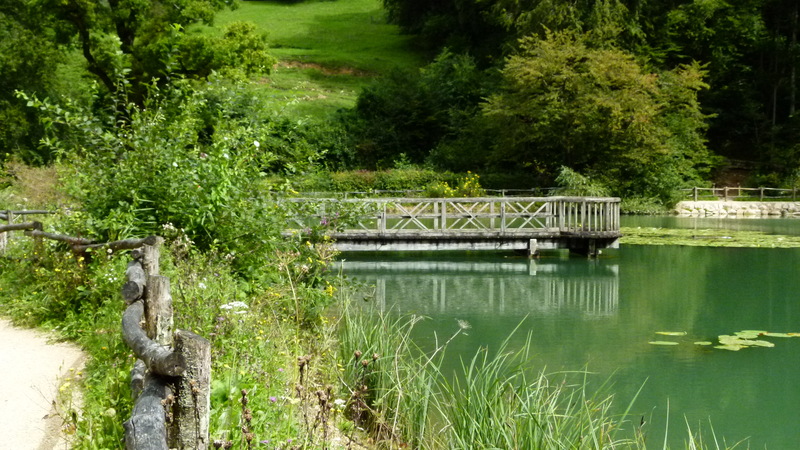 On a sunny day in June 2015, Andreas and Helga take their Nordic walking group to this idyllic place. To get to the restaurant Solbad in Schweizerhalle, we have to cross the Hard. “Hard” actually means “forest”. 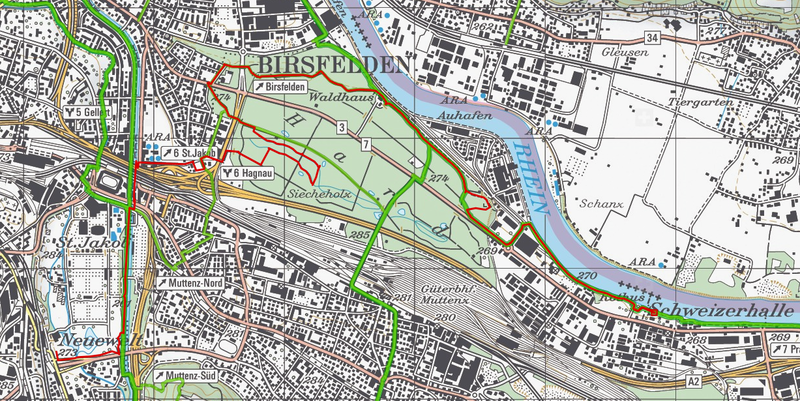 We start in “Neue Welt”, walk along the river Birs, climb up to the Hard, oscillate a bit to make enough kilometers (10 to 15km) and then take the “Rheinpfad” that leads along the Rhine with posts of interest on the way. The restaurant Solbad is in Schweizerhalle. The Hard supplies water to Basel. As this panel says, water from the Rhine becomes pristine water (from the Rhine=Rhein, made pristine=”rein” – a game of words in German). 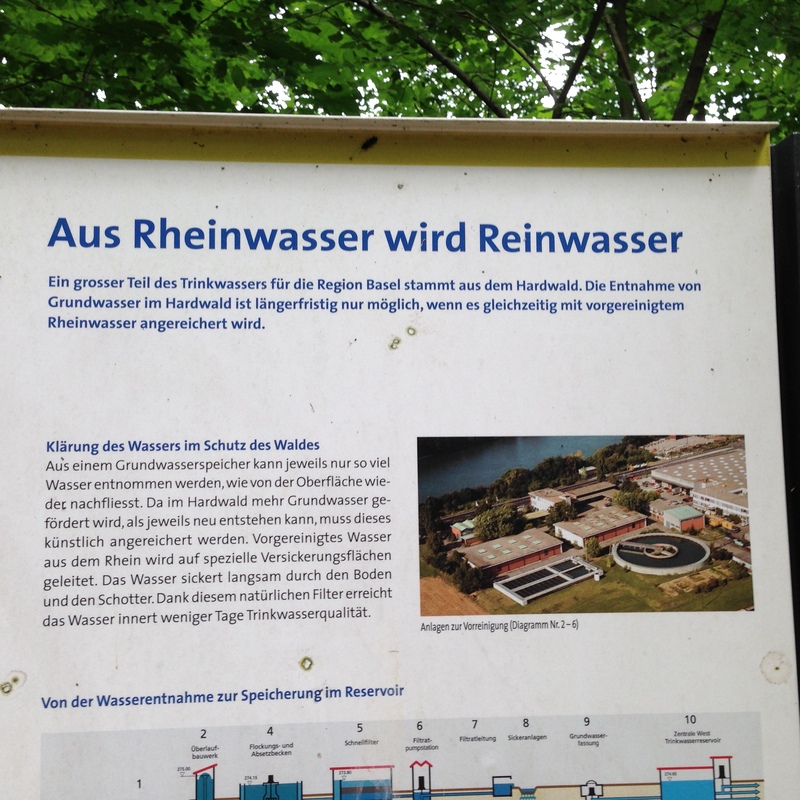 Rhine water is pumped up and then purified in filters. 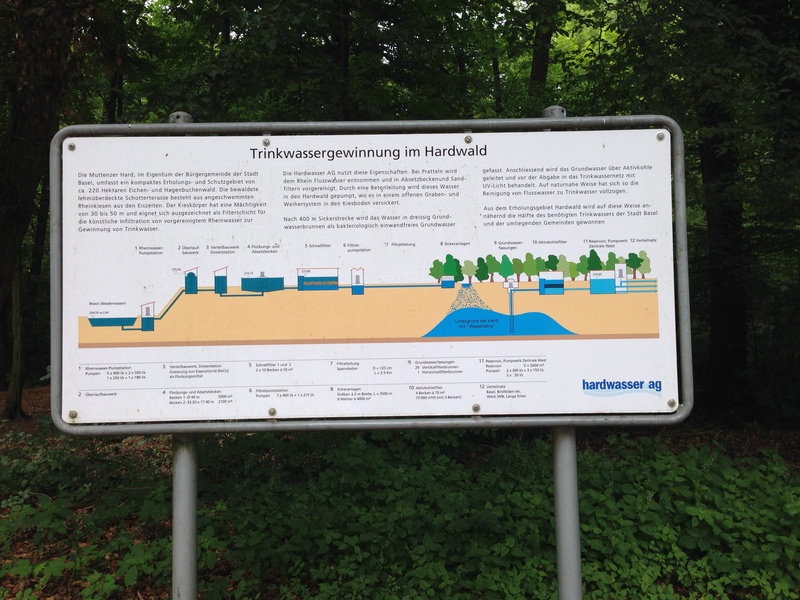 The purified Rhine water is directed to water channels with gravel beds. It sinks to the ground and adds to the Hard groundwater. 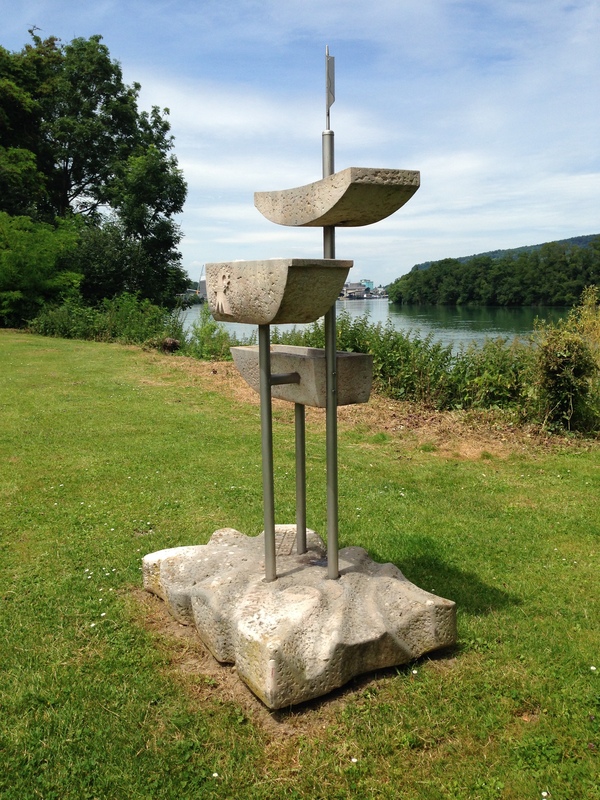 The clean water from the river and the ground is then transfered from the Hard to the Langen Erlen north of Basel that also has its own groundwater. From there it is provided to the town. 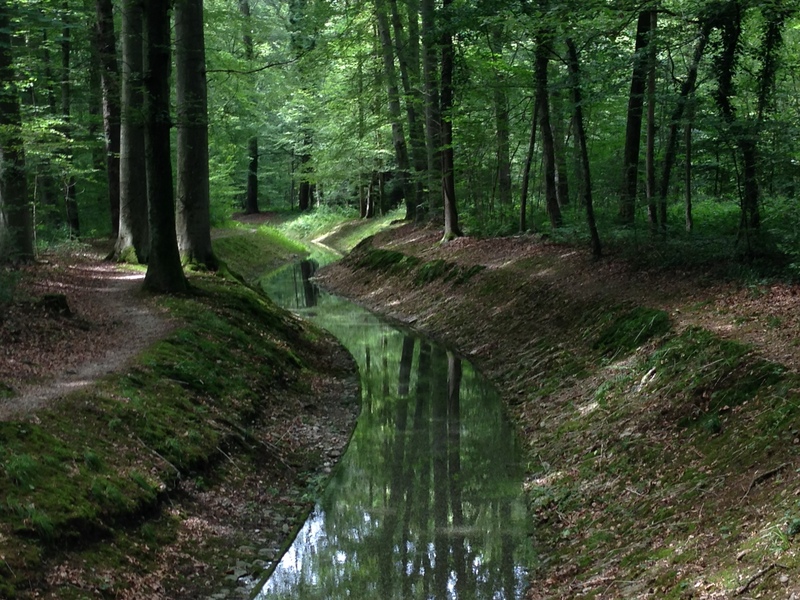 These water channels are part of the purification system in the Hard. They add to the romantic atmosphere that walkers find here. 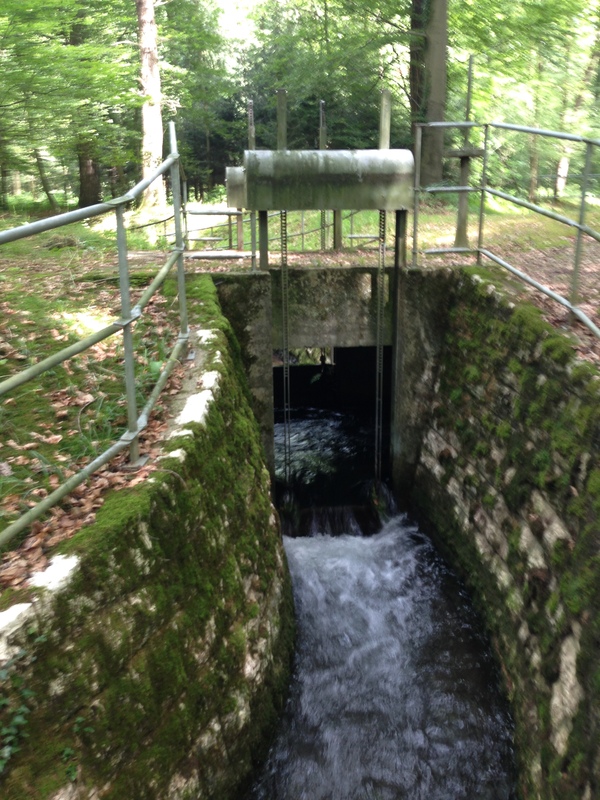 There is a control system to feed the water channels. Wooden bridges allow to cross the water channels. 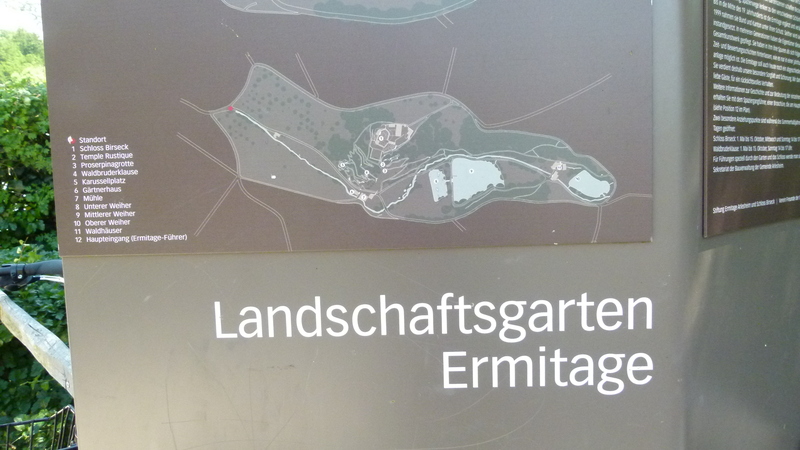 We make a loop following the water channels and then leave this area to continue along the Rhine. 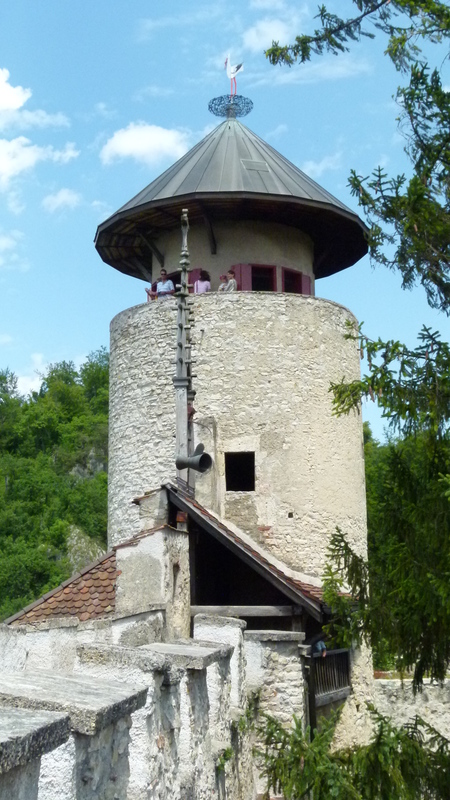 This late Romanic watch tower borders the Rhine. It was built in the late 4th century, when the Romans came more and more under pressure by the Germanic and Alemannic tribes. Just the stone basement is left and has been preserved in 1975. Not far from the watch tower – when still walking in the woods – we hear a terribly loud noise. 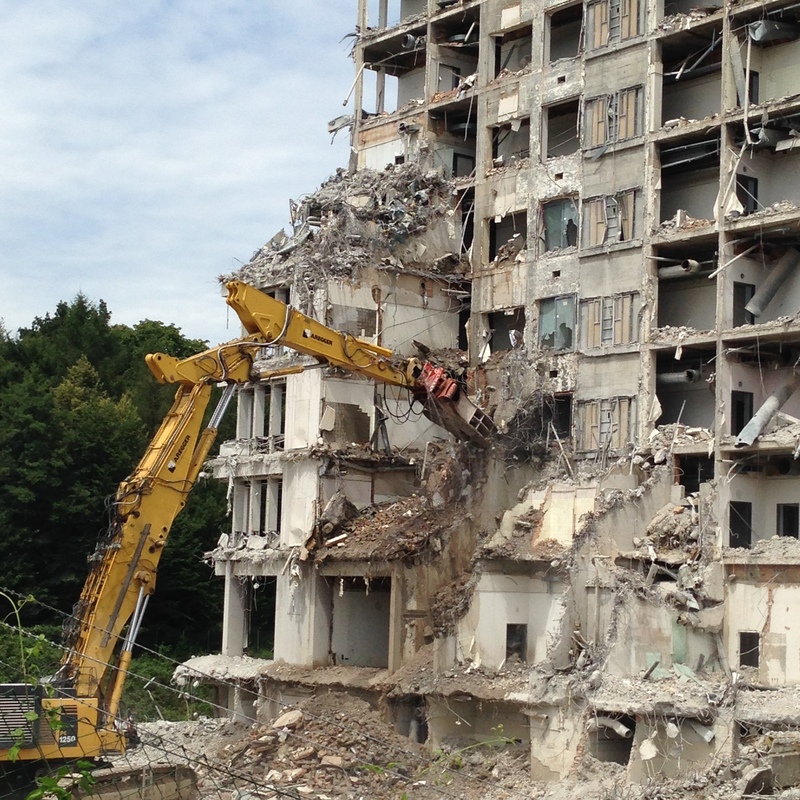 When leaving the woods, we see this huge industrial building that is now it being dismantled piece by piece. When walking by, we almost have to protect our ears. Our last place interest is the “Schiffahrt mit Muskelantrieb” or “navigation driven by muscles” (named “Rothus” on the map). 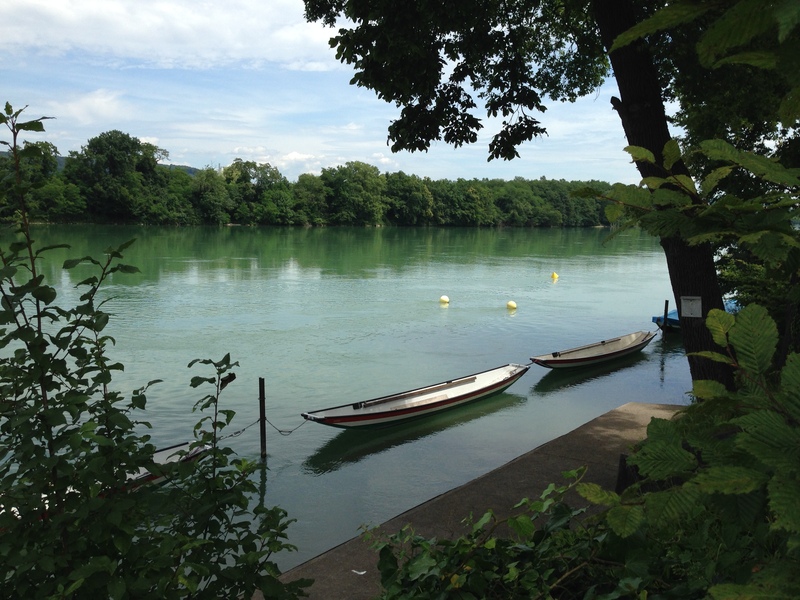 These are the boats that are driven by muscles – we call them “Weidling” which is similar to a “punt”, as Wikipedia says. Soon after this boats place we reach the garden of the restaurant Solbad and order a drink to cool down. Thank you, Andreas and Helga, for having showed me some more secrets of Basel region. From the restaurant Solbad I walked back home the same way to enjoy it once more and take the fotos using my iPhone. I look forward to more treasure hunting with you. My grandma loved the Ermitage. Around 1900 she went as a child, and later in the 1920-ies she came with her in-laws from Heidelberg. Then in the 1950-ies, she took me to the Ermitage. I was a child and I still see me stand on this platform and feed the carps with old bread found at the bottom of the huge hand bag of my grandma, amidst great fruit candies. The platform is still the same. The Ermitage is the largest English garden in Switzerland. It was created in 1785 by Balbina von Andlau-Staal (wife of the bailiff of the prince-bishopric of Basel) and her cousin, Heinrich von Ligerz. As opposed to the geometric French gardens, the English style gardens were made to look natural, following Chinese garden architecture rules. 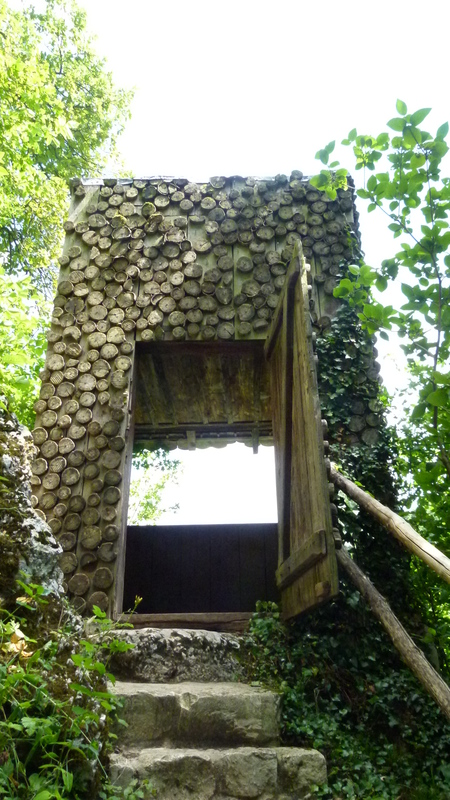 The rules included setting up places of interest such as caves, ruins, monuments, fountains, water falls or leisure corners, and the Ermitage garden benefited from the steep hill of the Birseck castle with its natural caves. Already in 1785 the garden was open to the public. A few years later during the French revolution, the garden was devastated by the farmers around Arlesheim and by French troops. Also the castle of Birseck (former seat of the bailiff) was destroyed in the process. In 1811 the son of Balbina, Conrad von Andlau, had the Ermitage rebuilt, supported by Heinrich von Ligerz, now an old man. 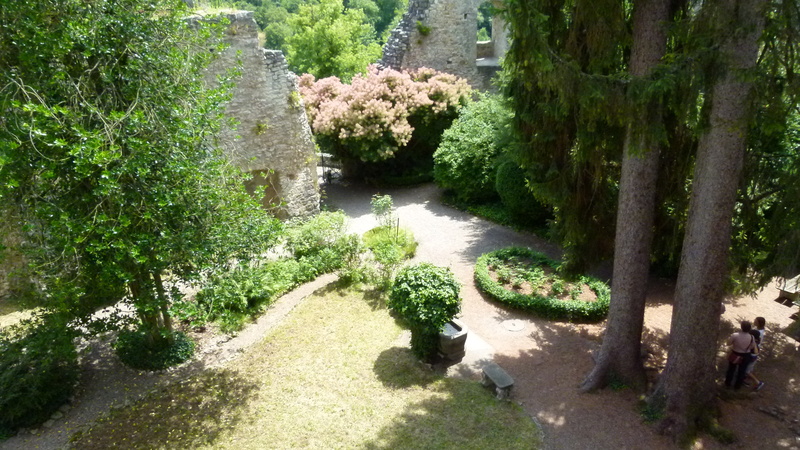 The castle of Birseck was partially rebuilt and integrated in the Ermitage garden. The garden reopened in 1812. It subsequently changed ownership various times and since 1999 it has belonged to the Stiftung Ermitage Arlesheim und Schloss Birseck. 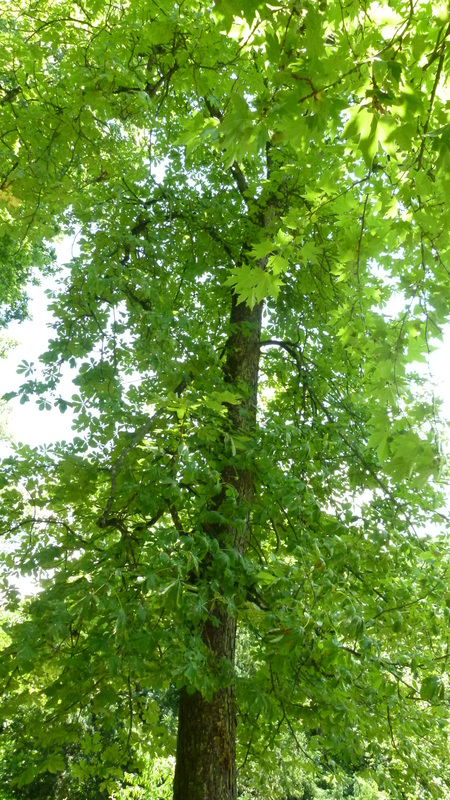 My sources are: The Ermitage Website , “Die Höhlen der Ermitage bei Arlesheim” (by Erich Plattner) and also listening to the guides in the garden. On June 27th 2015, the Ermitage celebrates the 230th anniversary. 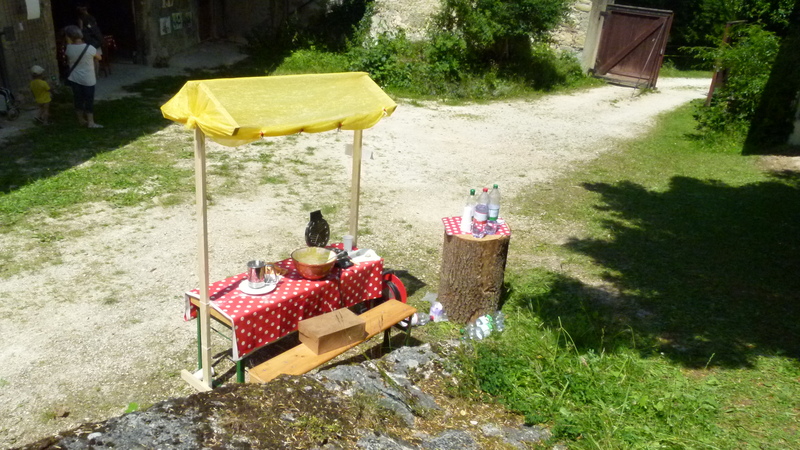 Places of interest such as the caves or the Birseck castle are open and looked after by members of the foundation (Stiftung) or by citizens of Arlesheim. “Ab uff d’Sogge” – this is how we Swiss say “let’s go” or literally “let us go on our socks” (“Sogge” are “socks” – as shown on the sign). “Ab uff d’Sogge”… Arlesheim invites us to the Ermitage. Well – let us go and “ab uff d’Sogge” to explore the surprises of the Ermitage that has dressed up for the anniversary of 230 years. Source: “Die Höhlen der Ermitage bei Arlesheim” by Erich Plattner. 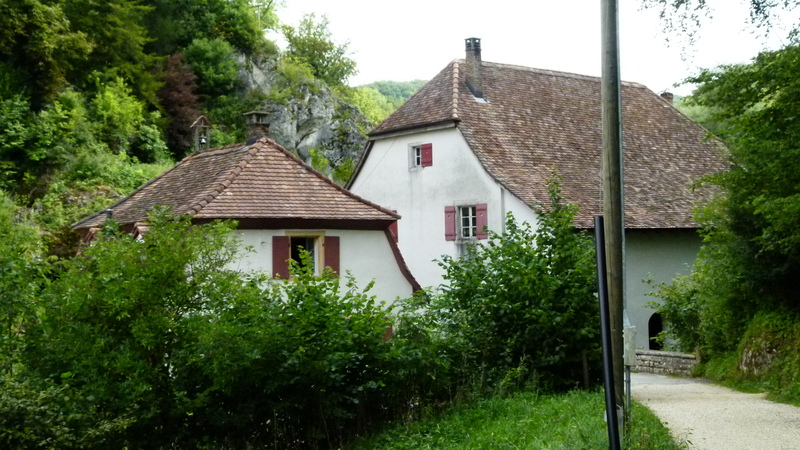 Near the entrance to the Ermitage is the so-called “Schleife”, a small house. A basket contains material about the sights and activities in the Ermitage. The garden is a coffee place today. I have some cake with a coffee. Water is free. It is spiced with fresh mint leaves. 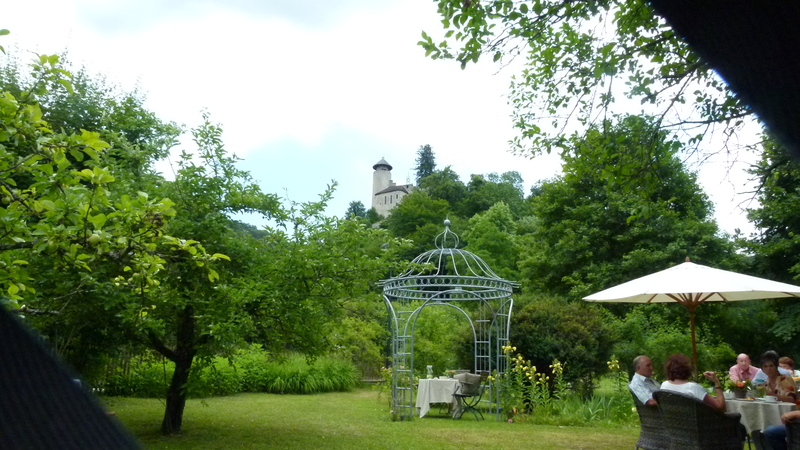 In the background above the garden is the Birseck castle sitting on top of the hill. 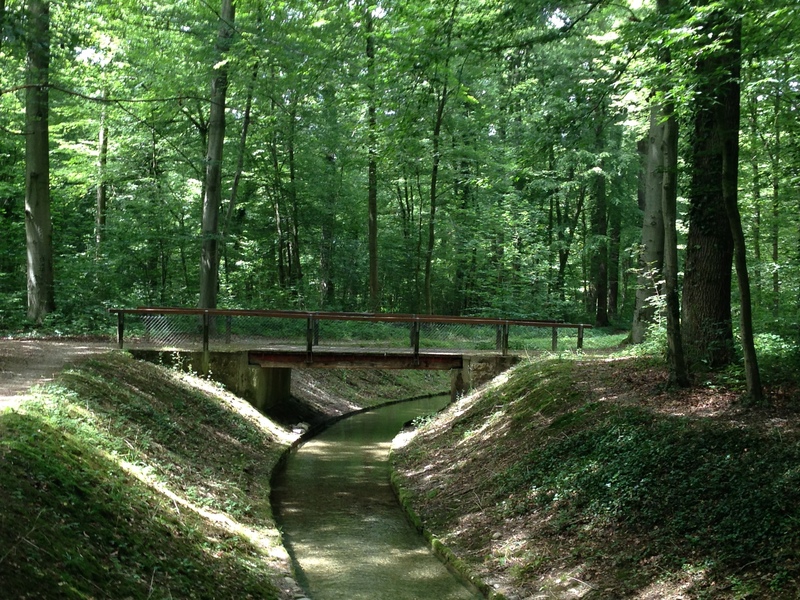 On the slope under the castle, winding narrow paths invite to explore the caves, monuments, the house of the brother in the wood (Waldbruder) and more secrets hidden in the English garden. The old mill is open today. There is a gallery inside. Earlier today there were anniversary speeches held in the mill. The main entrance to the hill area with the winding paths and caves is behind the mill. It is called Felsentoreingang (rock gate entry). Erich Plattner sells his book just next to the main entrance. I buy two copies, one for me and one for the Austrian friends that have taught me so much history and geography while taking me for walks aorund Basel. 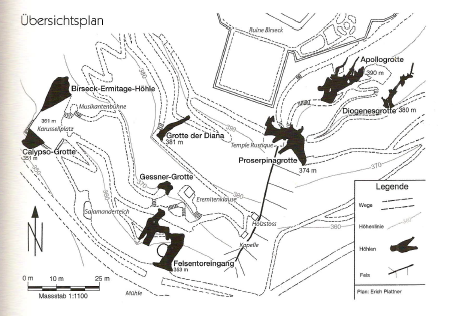 This is Erich Plattner’s plan of the caves and the winding narrow paths leading to the Birseck castle. It is the best map that I could find. In detail, Erich Plattner explains, how the caves emerged in a former riff area (shore of the paleolithic Thetys Sea) and then were transformed at the edge of the later Rhine valley ditch (p. 45ff). He also describes, how the garden architects transformed the caves to fit into their English garden concept. Many caves were enlarged and decorated, however the Calypso cave was destroyed, because they built a large platform above it, for a carousel at that time. Most caves have names taken from the Greek mythology such as Apollo or Diana. 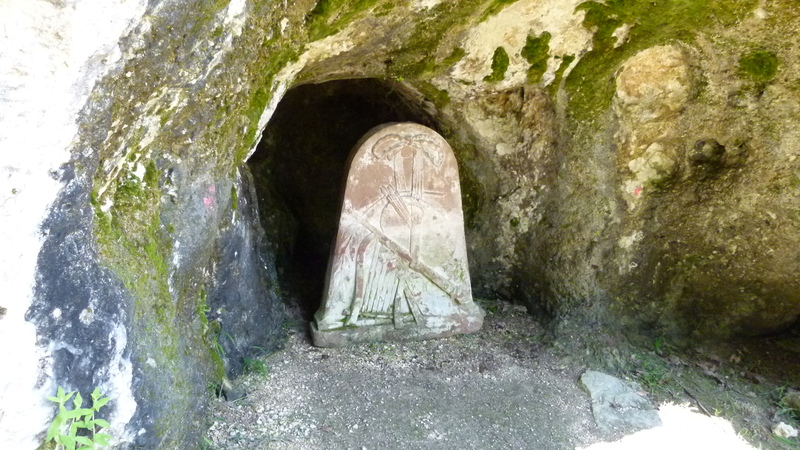 Diogenes and Salomon Gessner (around 1780 a famous poet from Zurich) also have received their caves. I dive into the garden using the path behind the Felsentor and reach my first cave, the Proserpinagrotte. Every twenty minutes, Sibylle von Heydebrand lays out the history of this cave which is the largest in the garden. I join the next group. Inside is a large hall. Stairs lead to the next level, and they are lit by petroleum lamps common at the time, when the garden was built. 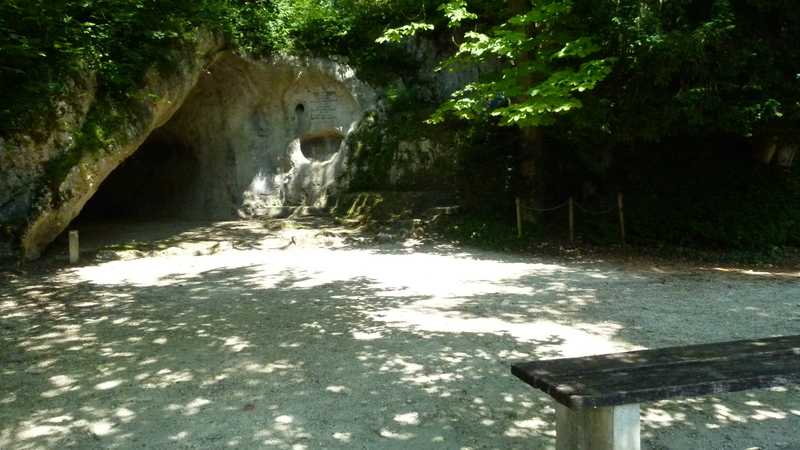 Listening to the guide and reading Erich Plattner’s chapter about the Proserpina cave, I start to understand, how important these caves were for the experience that the English garden architects intended to provide to visitors. 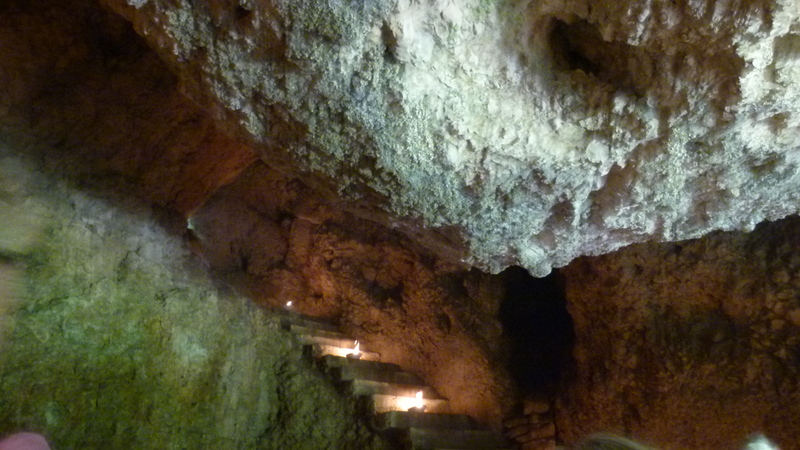 The architects enlarged the three halls of the Proserpina cave and connected them using stairs and corridors. Proserpina (or Persephone) was the daughter of Zeus and Demeter and she was kidnapped by Hades. She represents the idea of death and resurrection and this lead to changing arrangements in this cave. In the first setup, there was a gate to the cave – or the underworld. 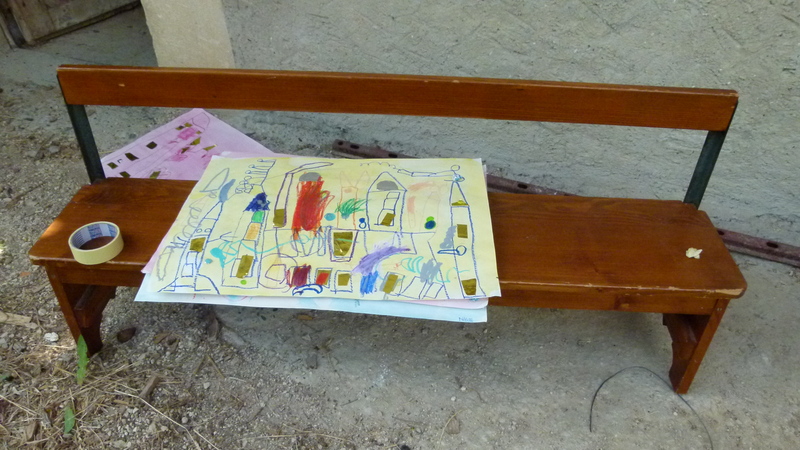 A bench in front of the gate invited to meditate (there is still a bench here today). The first hall was the underworld, represented by a black altar, a spying dragon and a crocodile, all lit by lamps. Stairs lead to a platform with a statue of Proserpina on it. There was also an owl that had eyes lit by a lamp. 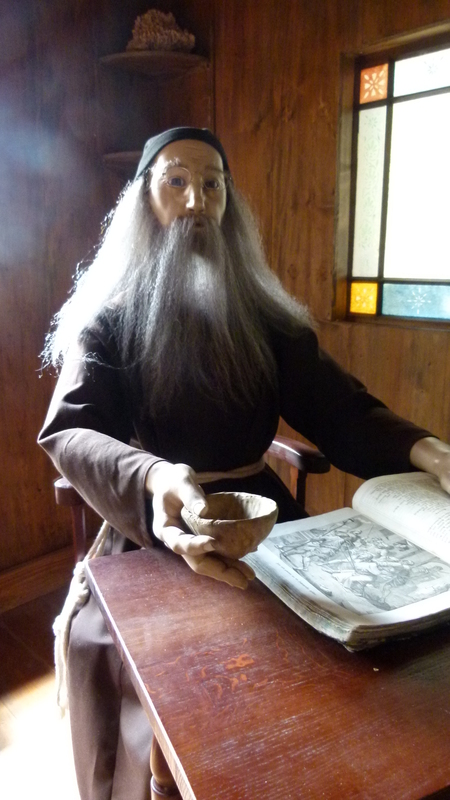 When going up the stairs, a devil made of wood would jump into the face of the visitor. Rather scary. This tunnel of horror setup was changed after two years; free masons redid the cave. They made the allegory of the death on the first floor less scary and left the Proserpina statue on the platform. 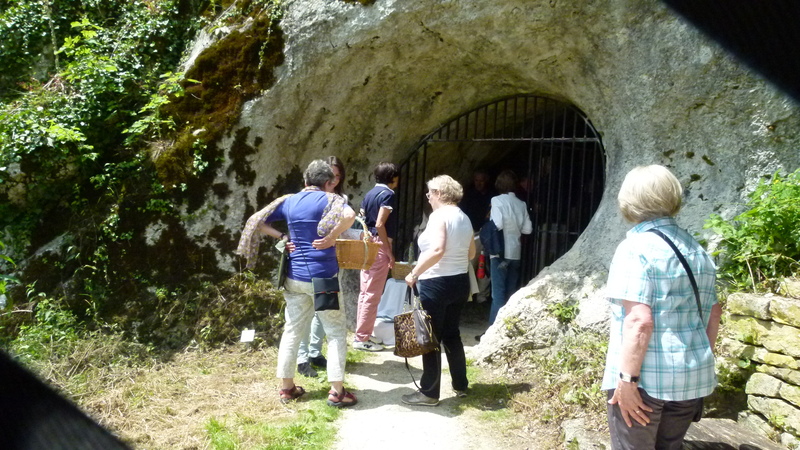 Visitors reported that they were very impressed by the allegories of death and resurrection in this cave. During the French revolution the cave was destroyed completely and then rebuilt. 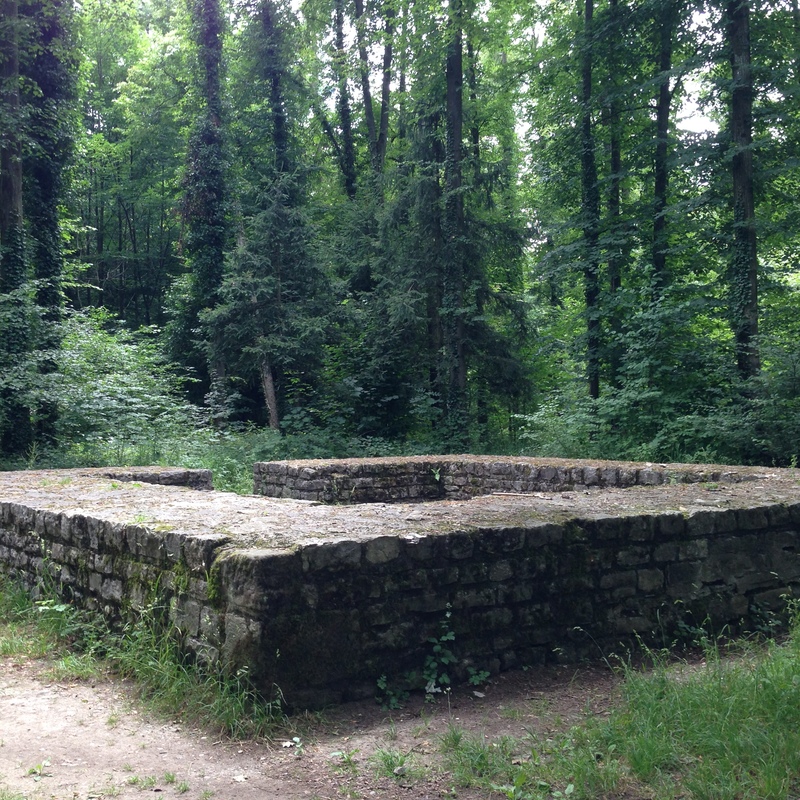 In the first hall Heinrich von Ligerz built a tomb to remind of the death of Balbina in 1798. Today there is a copy with a typing error, as our guide points out: The date of death is 1788 – no, it is 1798! (More details in Erich Plattner’s book on p 97ff). 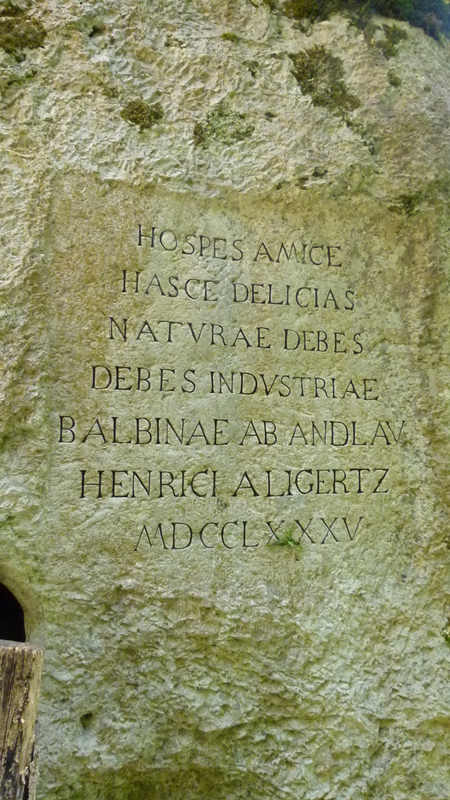 Climbing towards the Birseck castle, I come across this inscription for the founders of the Ermitage… it is near the Diogenes cave. 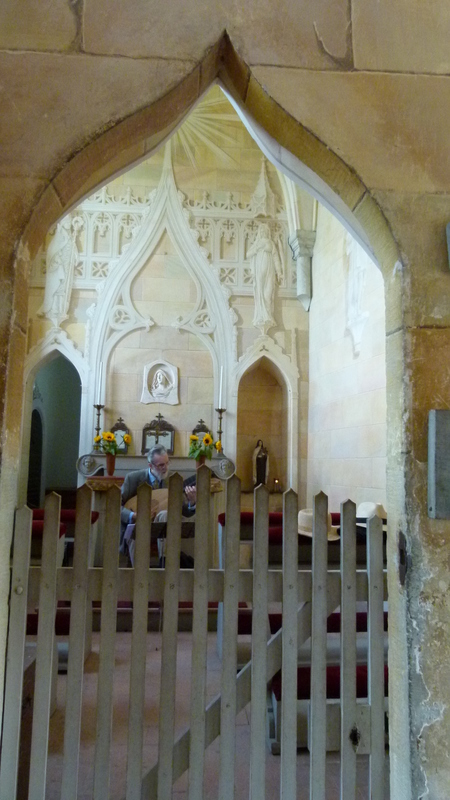 … and listen to music played in the chapel. In the great hall nearby, a group of students from the Goetheanum (“Am Wort”) recite Faust and sing songs composed by Schubert. The language of Goethe is very sonorous, but difficult to understand. 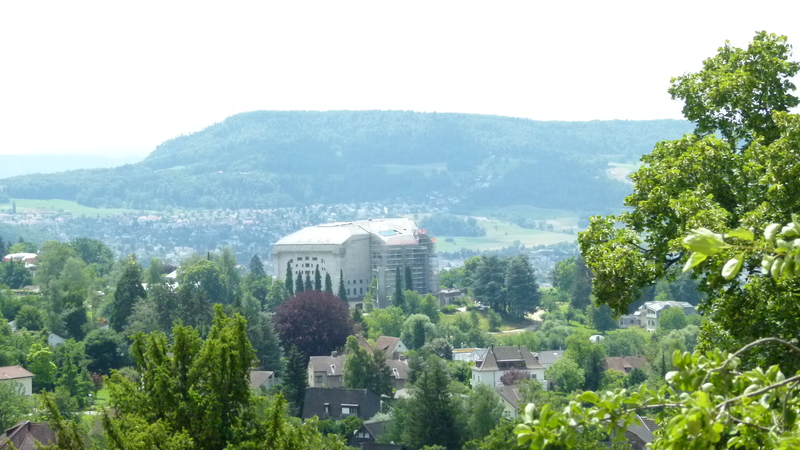 Well, the Goetheanum is not far and I am impressed by the professionalism of the performance. The castle keeper tells us that after having been destroyed in the French revolution, the Birseck castle was rebuilt not based on original plans, but based on what was thought to match best an English style garden. The tower and the great hall as well as the pinnacles were the result of those ideas. Only the chapel has remained from the former Birseck castle. It is already half past two and the Ermitage event closes at 3 PM. I enter the Weidhof just behind the Birseck castle. A young boy sits next to an empty pastry bowl and a waffle iron. … and this must be a shop to buy paintings. I think back of my childhood and my grand’ma that had often taken me to the Ermitage. 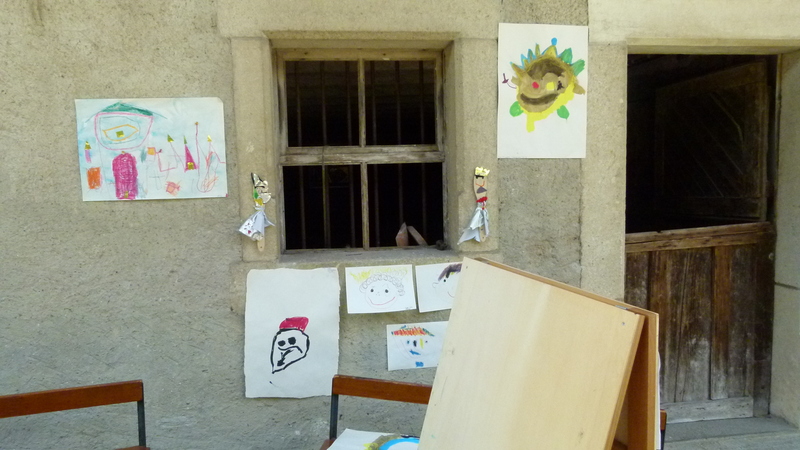 With a smile on my face, I leave this place, feeling sorry that I was too late to watch the children producing and selling works of art here. This children’s playground is a great idea. Now I oscillate a bit to find the brother of the wood. I come across this strange hut – or whatever it is. It takes me some time to understand… this is the wood log pile of the brother of the wood. Of course, clear, the brother needs wood to heat his little house. And the pile of wood cannot be too far. When the door is closed, this “thing” looks almost like a pile of wood. But the phantasy of the garden architects was unlimited. They added a door to the pile that can be openend – and from inside there is a great view of the Gobenmatt valley. They must have done this construction with a twinkle of an eye. Or of two eyes even. Not far from the wood pile there is a chapel (handy for the brother, should also not be too far to walk) and then I find the brother reading in his book. A girl and her mother are inside the house as well. The girl gives some coins into the bowl and the brother nods. Yes, these garden architects surprise me with all their phantasy. Mum and her daughter leave the place. I am now alone with the member of the Säulizunft that looks after the brother. 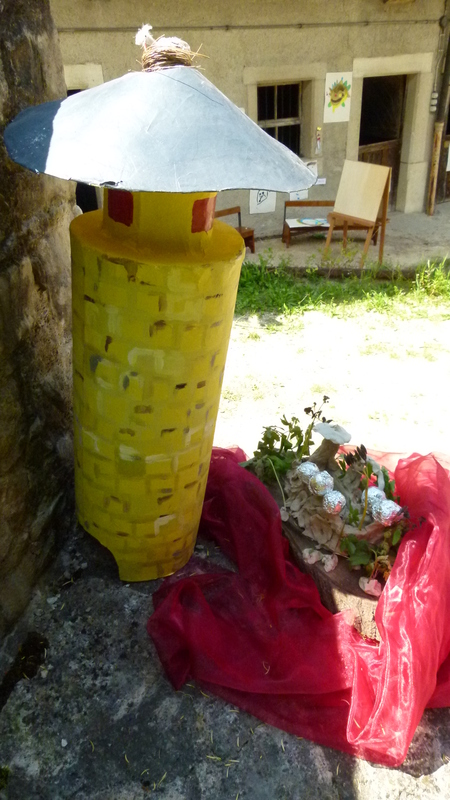 Together we think about Arlesheim and only now I understand – not all Baselland is protestant. Of course not, I could have understood this before. Arlesheim was part of the prince-bishopric of Basel, which was a catholic institution. And it was only after the Congress of Vienna in 1815 that Arlesheim became part of Basel (and after 1833 it split off with the rest of Baselland to become part of the half canton). Close to the brother of the wood I find the Gessner cave with the memorial of this poet known around 1800. I walk down to the Birseck Ermitage cave and the carousel platform. This was the place for leasure. Once upon a time, there was a carousel here and stairs lead to a stage for musicians. Well, I just sit down, look up into the crowns of the trees and dream. I think, this is what the garden architects wanted to give us – just dreams. I am full of new impressions. And I know, I have not found all the surprises that this English garden holds. I leave now, and I intend to come back and book a tour with Sibylle von Heydebrand. May be for our next meeting with my school mates.